ScarAway helps restore raised and discolored scars to a more natural color and texture, using the same technology trusted by burn centers and plastic surgeons. Using ScarAway on newly healed wounds helps prevent the formation of unsightly scars. Even scars that are years old from burns, surgical procedures and injuries show significant improvement with ScarAway. Previously available only to medical professionals. Now available to you. Made from a patented material that provides a unique combination of breath ability, flexibility, wash ability and adhesiveness, with a silky fabric backing for optimal convenience and comfort, even under clothing! Scar Away comes with 12 reusable 1.5" X 3" silicone scar management sheets. The easy-to-apply self-adhesive sheets can be cut to fit the size of the scar, or worn side-by-side for larger scars. Patented Silon sheets mimic the natural barrier function of normal, healthy skin, increasing hydration, working to soften scar tissue, reducing it's development and causing it to fade away. So comfortable, you'll forget you're wearing it! 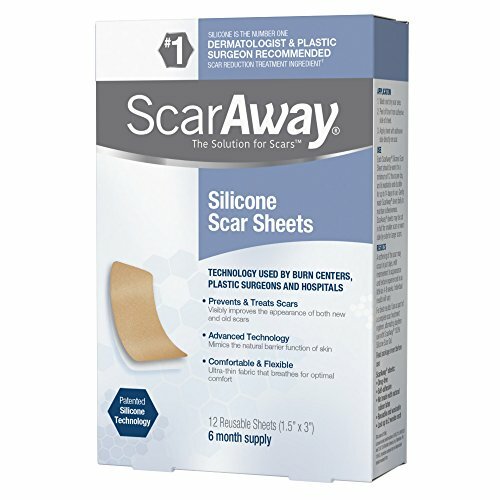 ScarAway is the only product to provide the full, recommended 12-week supply of scar sheets in one box. **Why do all silicone scar sheets "compare" themselves to Neosporin Scar Solution? ** Pfizer held the license to manufacture Scar Solution using Silon technology for several years. When Johnson & Johnson purchased Pfizer, Inc. in 2006 it was decided to not continue the product. However, demand continued and in 2008, Bio-Med Sciences entered into agreements with Mitchell-Vance Laboratories which now offers ScarAway. Scar Away has larger sheets and significantly improved quality and adhesion.